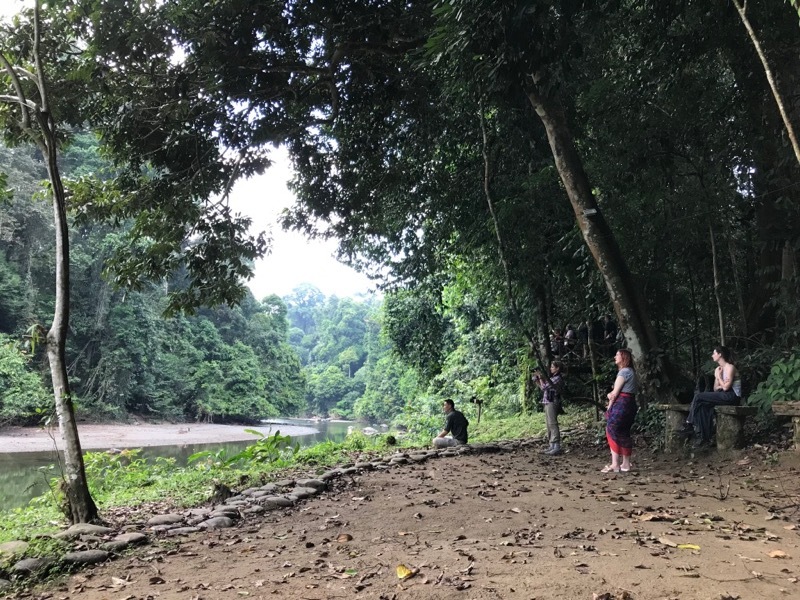 For the last leg of my Borneo adventure, I visited Danum Valley, which is one of the largest areas of primary rainforest left in Southeast Asia, in the state of Sabah. There are essentially two places to stay in Danum Valley: the Field Center, and the Borneo Rainforest Lodge. The Field Center is inexpensive and primitive and it seems they're not really very happy to have non-scientists around. The Borneo Rainforest Lodge is expensive and the opposite of primitive. Some birder friends of mine who have traveled all around the world told me that if I ever went to Borneo I just had to stay at the Borneo Rainforest Lodge because it was probably the nicest eco-lodge they had ever visited. I took the bait and splurged on my last few days in Borneo. It was definitely the nicest eco-lodge I have ever visited. It was almost certainly the nicest accommodations of any kind that I have ever stayed in, built in one of the most beautiful forests I've ever seen. 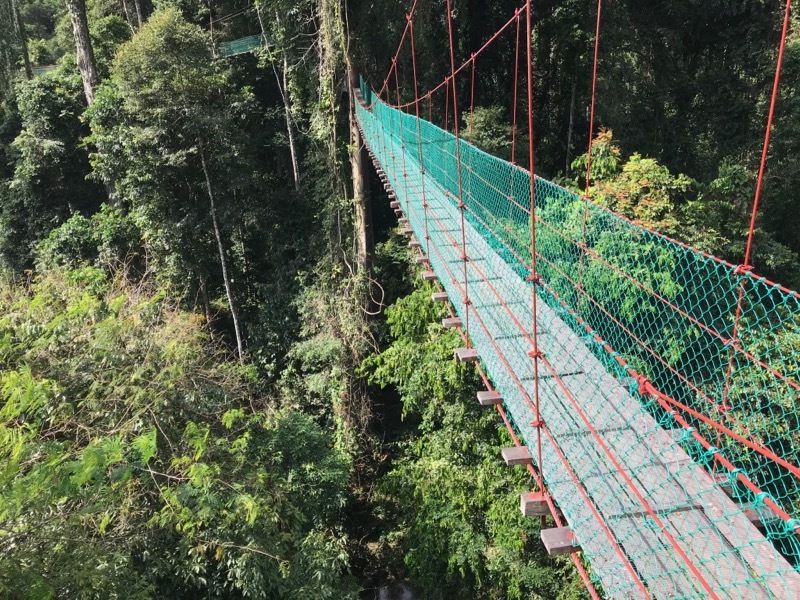 The lodge has a 300-meter-long canopy walk, which provided amazing views and from which apparently many fine birds could be seen if you got up early enough to visit it first thing in the morning. I did not, and saw only a few mediocre birds. I was hoping for some flying lizard action up there but my hopes were unfulfilled. 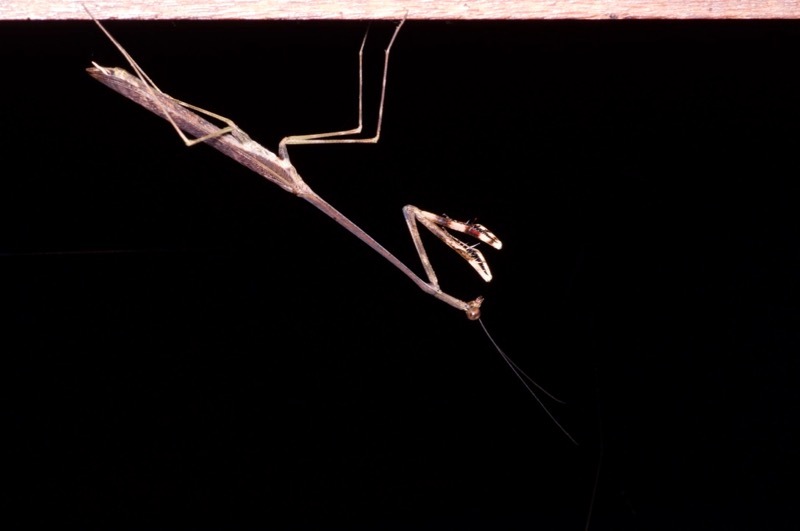 Let's start with the weird bugs, as usual. 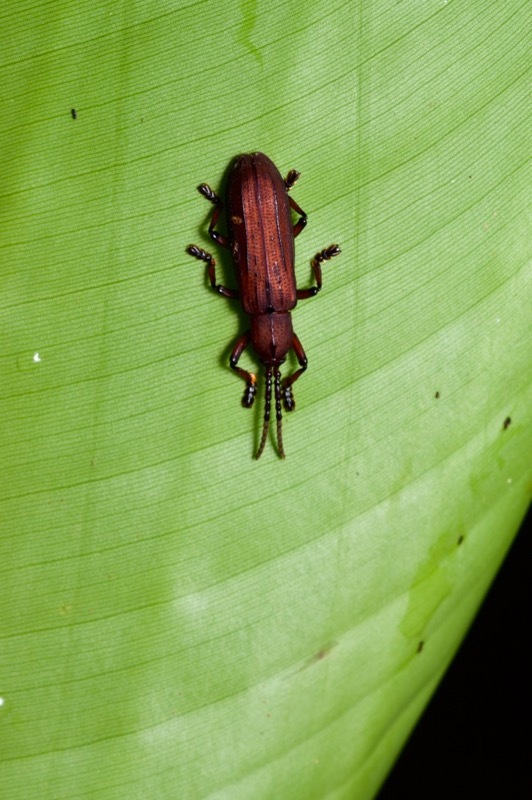 Cool little weevil. Probably not actually made of rubber, though it looks like that to me. 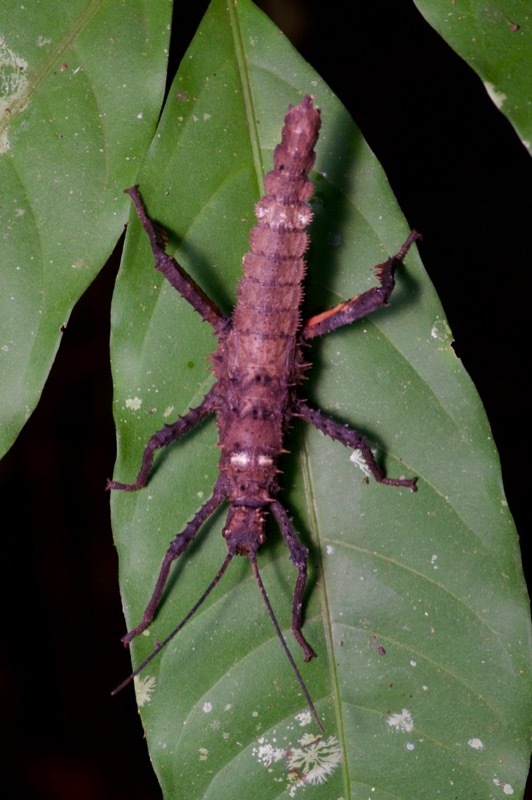 Like every other location in Borneo, Danum Valley has plenty of phasmids. 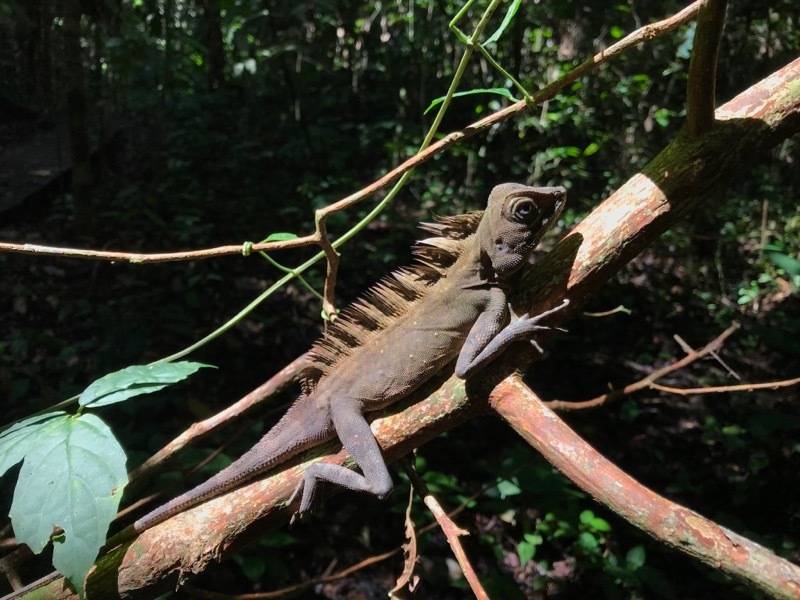 Now we come to the herps, and the big reveal that despite its location in primary rainforest, Borneo Rainforest Lodge just isn't a great place for herping. The reason is pretty simple: during the day, you're not allowed to hike without a guide except on one particular short trail, and at night, you're not allowed to hike without a guide at all. And the guides will only hike with you for a couple of hours or so. 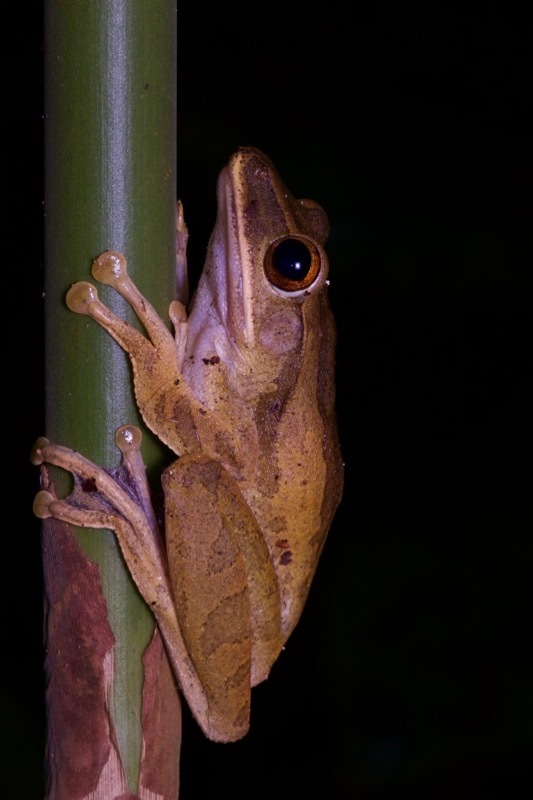 Everywhere else in Borneo I was herping every evening from nightfall until midnight or later, but here I was only out hiking at night from about 8pm until about 10pm. I pretended I didn't know the rules and did a little extra night hiking on the first night, but sure enough someone noticed and politely ended my wanderings. 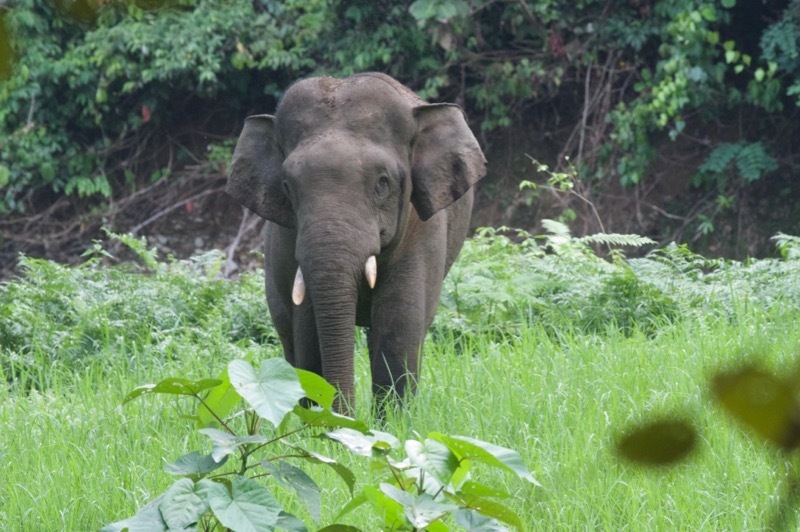 The rules aren't totally unreasonable, as some dangerous wild animals reside in the area, and it would no doubt look bad if any guests at the fancy ecolodge got mauled by elephants, for example. I doubt whether anyone cares about this at the Field Center, so if your main goal is herping then I'd recommend staying there instead. I was disappointed by the night-time limitations, but my stay was still very enjoyable. 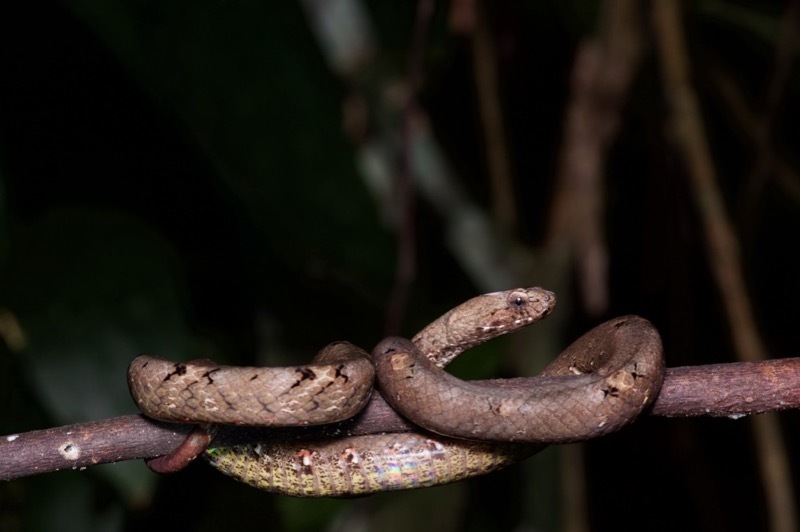 Anyway, that's all background for why I didn't see tons of herps at night in Danum Valley. This is hard to even believe, but the only frogs I saw at all were all in or around a small pond near the buildings; I saw none at all in the forest. 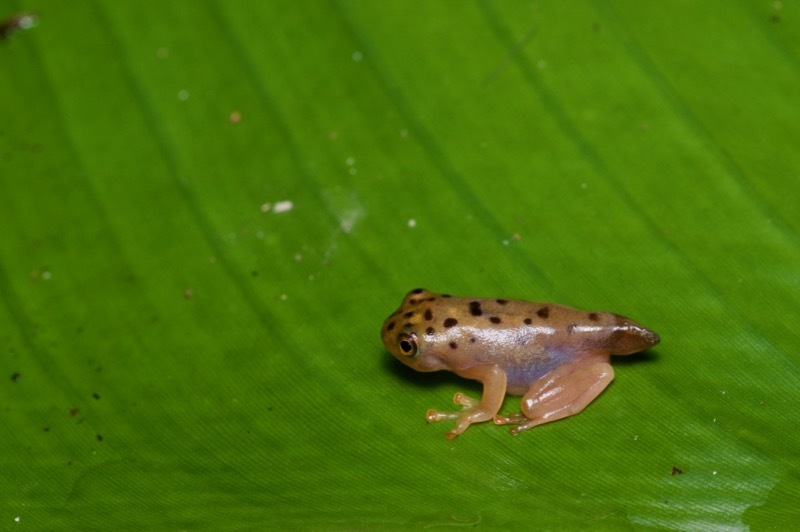 And the frogs I saw at the pond were all common species that I had seen many times elsewhere in Borneo. 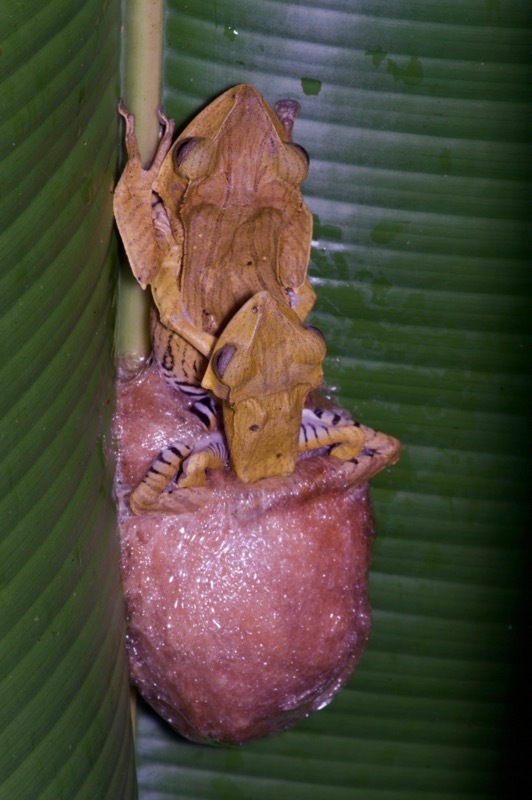 The best sight at the little pond was a pair of File-eared Treefrogs making one of their foam nests. 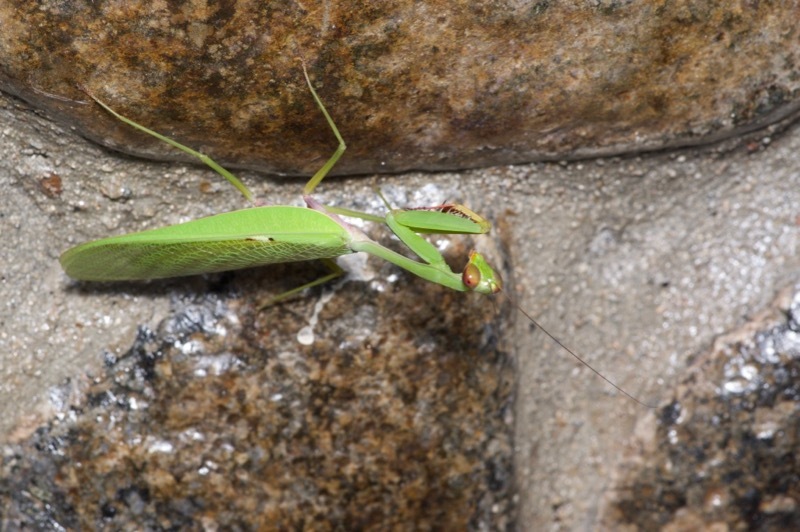 The female lays the eggs in the foam. When the tadpoles emerge from the eggs, they push their way through the foam and fall into the water below. 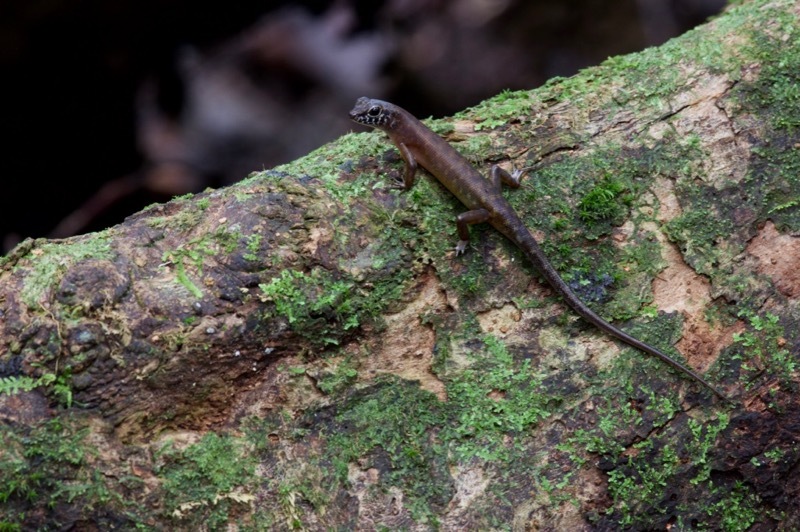 In the forest, many tiny skinks shuffled through the leaf litter and posed on logs. The closed canopy made for dim light, so I was glad that the skinks held perfectly still for a long time, and that I had lugged my tripod around. This photo had an exposure of 0.6 seconds, and I have others up to 30 seconds. 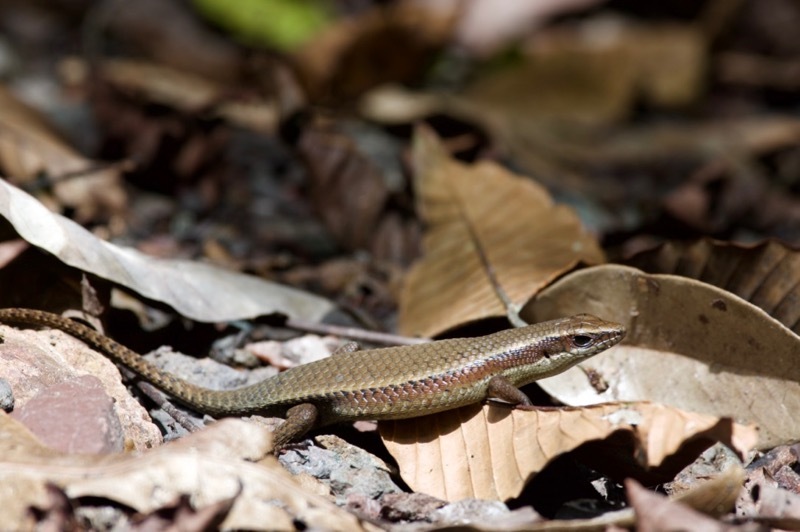 Larger skinks could often be found basking in the sunny patches. 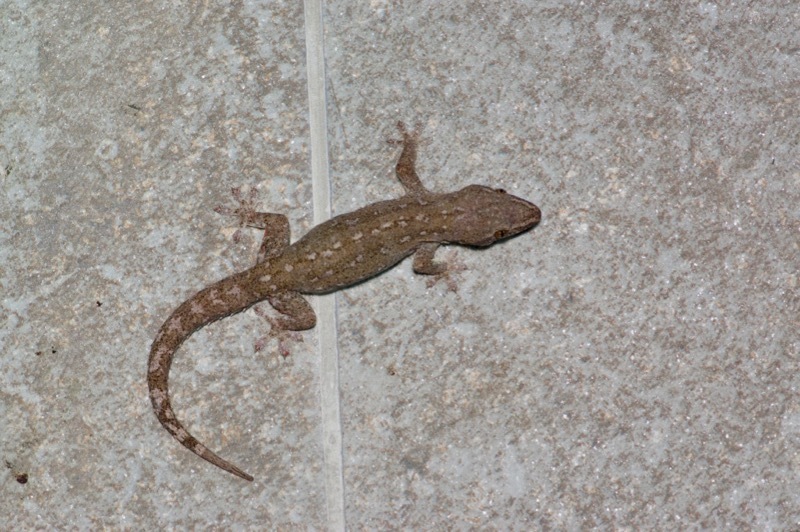 House geckos clambered around on all the buildings. 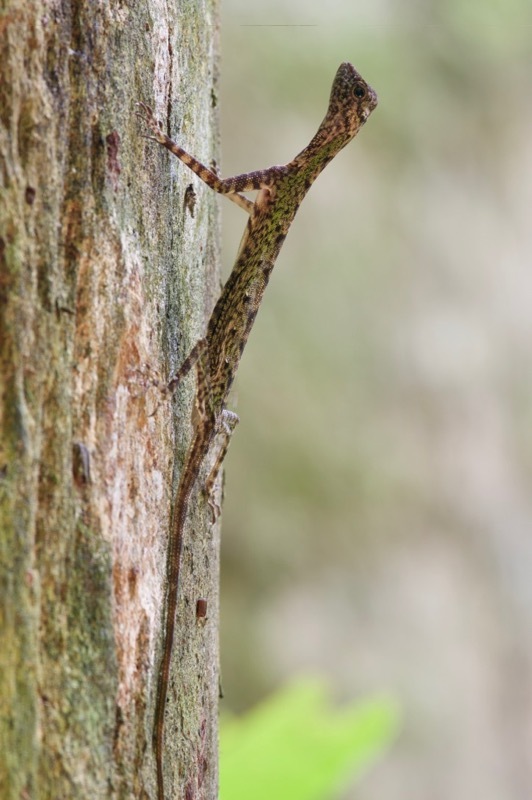 I only saw a single Cyrtodactylus gecko in the area, which is just nutty given how many I had seen everywhere else. But its coloring was very different than any of the many others I had seen. 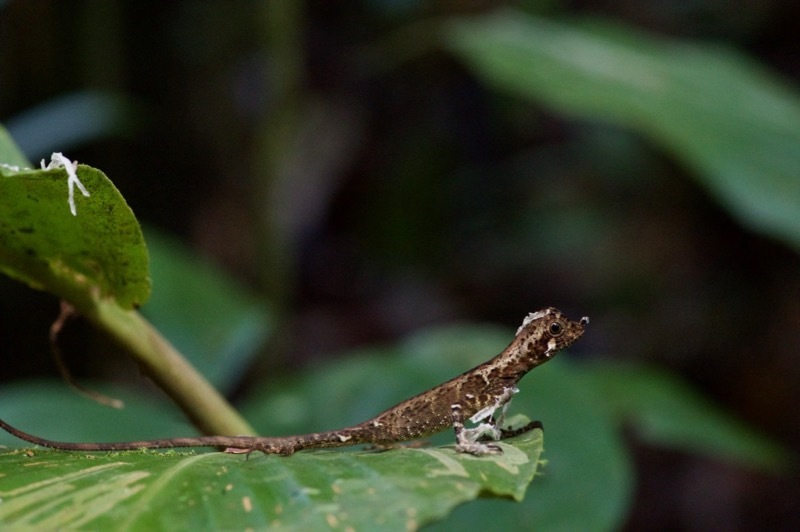 I told my guide that this one looked very unusual to me, but he said it was just a normal forest gecko. 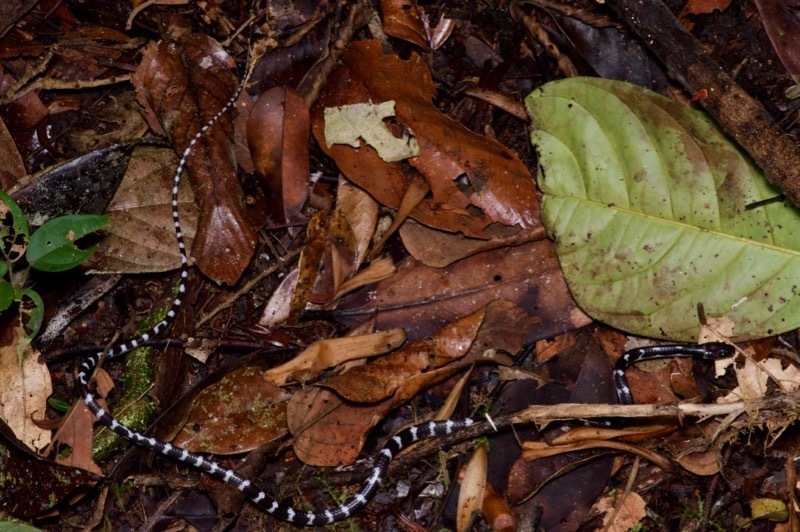 I later realized that this is indeed the normal coloration for this species, so my guide was right. 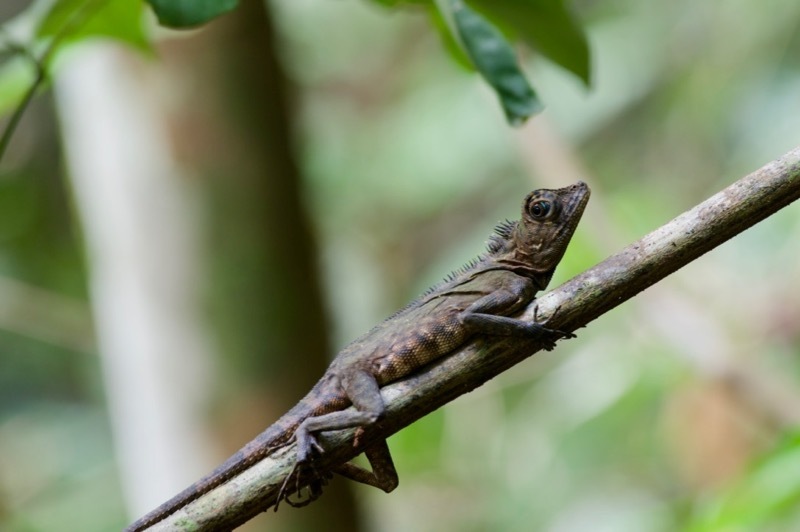 But it was a species that I hadn't previously seen, and that species does look quite different than any other Cyrtodactylus in Borneo, so I was kinda right too. One way I snuck in some extra nighttime herping was to linger around the buildings after my guide and I had returned from hiking in the forest. 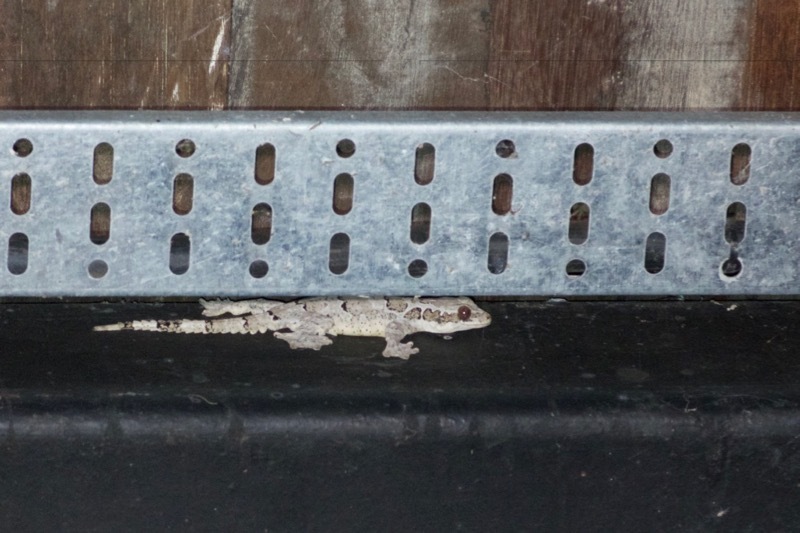 I found a very fine but also very distant gecko on one of these post-hike lingerings. 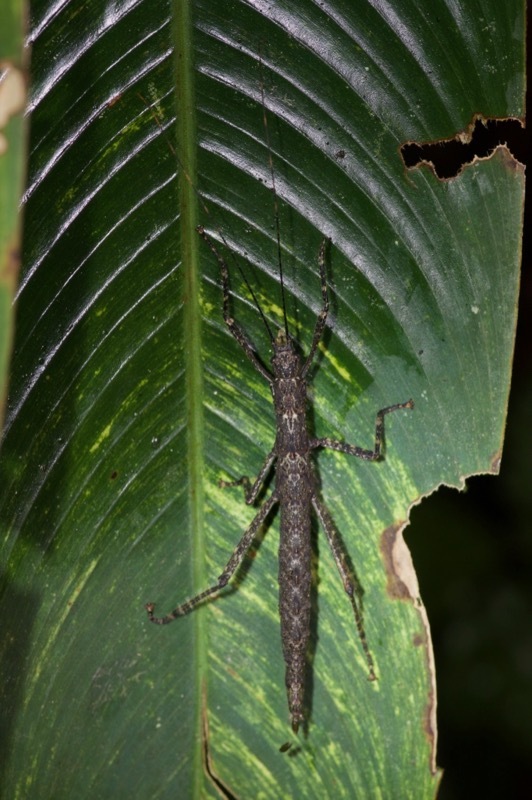 Danum Valley was the first place in Malaysia where I saw more agamids during the daytime than I did at night. (This is partly but not entirely because I wasn't out at night for as long as usual.) 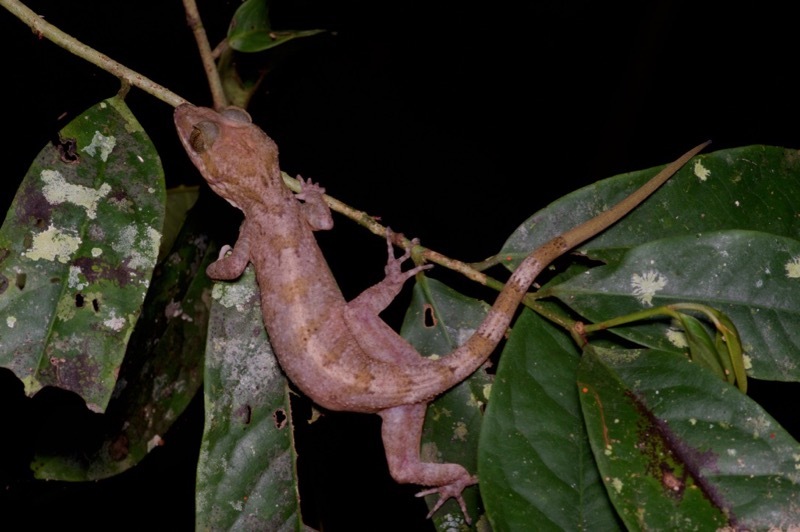 Impressive Bornean Angle-headed Lizards of various shades were plentiful by both day and night. 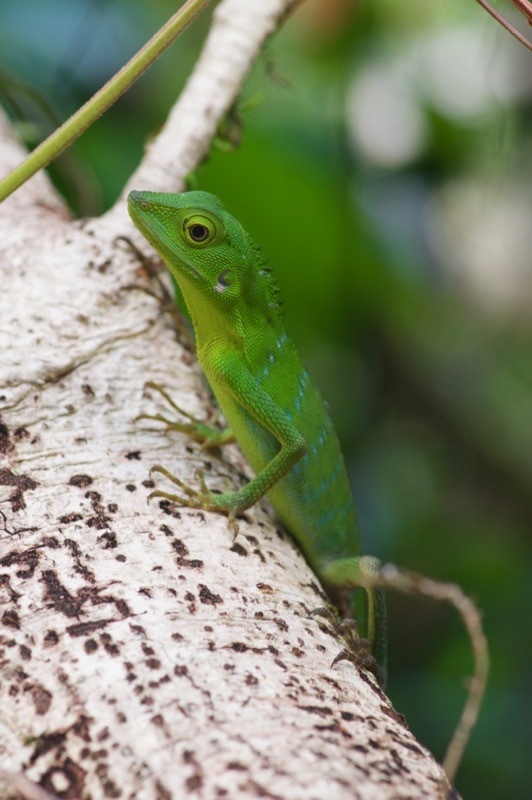 If you prefer your lizards in a bright green, you would still have been happy, because it wasn't too hard to find Green Crested Lizards. 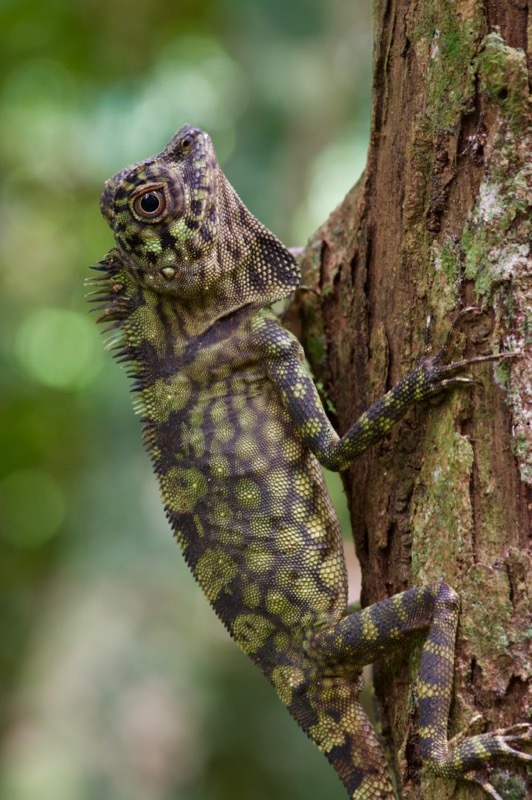 Every once in a while I'd spot a flying lizard on a tree. Usually it would then squirrel over to the other side and then skitter up and out of decent photo range. But occasionally I could approach one carefully enough with my tripod to get a decent shot. 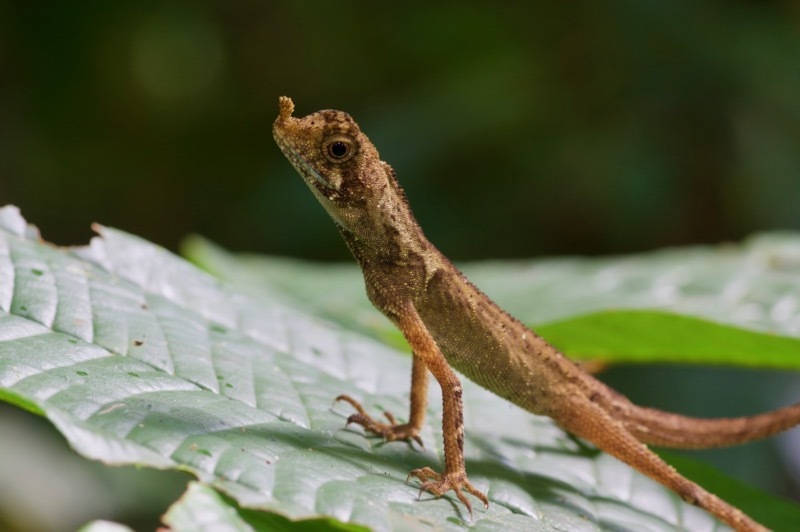 On my first stroll into the forest a few minutes after arriving at the lodge, I spotted a small agamid that I was really hoping to see, due to its silly rostral appendage. When I saw that lizard on my first day, I had yet to unpack my tripod, so I had to crank up the ISO to get a decent hand-held shot in the dark forest. On all subsequent hikes I kept my eye out for another, but hadn't had any luck. But on my last day, on my last short hike in the morning before I had to catch a mid-day ride back to civilization, I turned a corner and saw a proud fully-grown adult in a similar position. 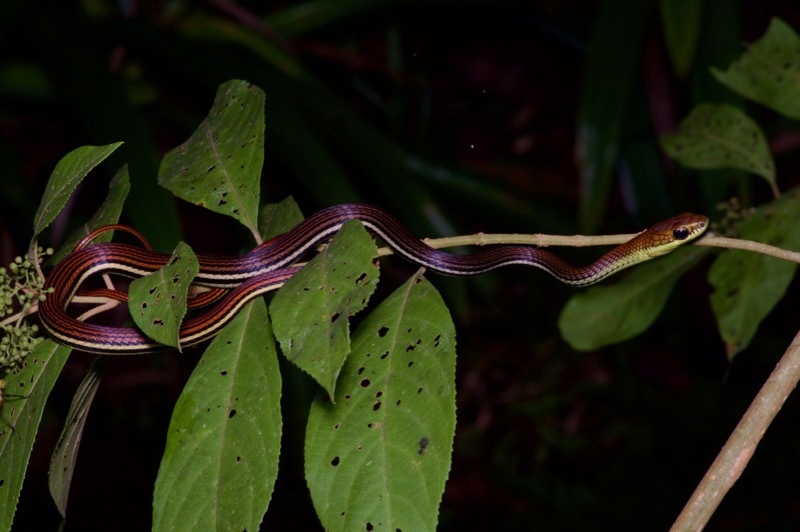 This baby bronzeback was draped across some leaves just around the corner from that first Aphaniotis ornata on my first hike in Danum Valley. It allowed me to get close enough to take this photo with my iPhone. My guide tried hard to find me snakes, but it's never easy to find snakes in the rainforest and especially not without spending a lot of time. He did find a couple more bronzebacks sleeping at night. 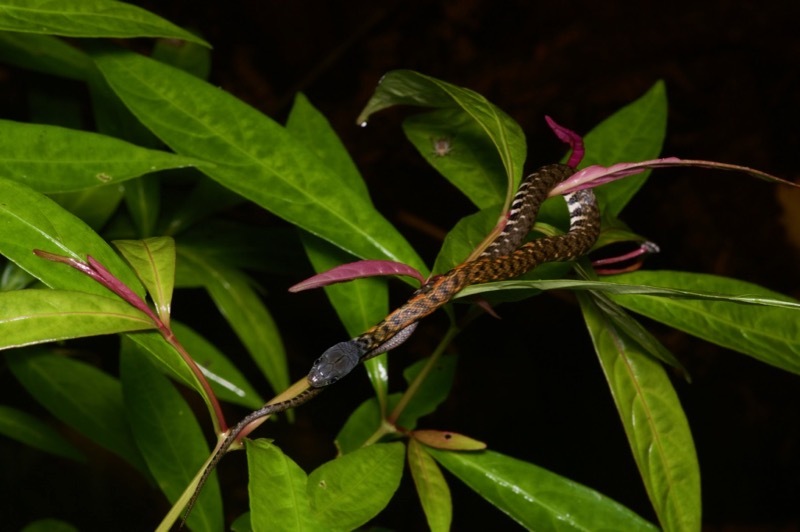 He also found a few keelbacks in and around the little frog pond at night. Most of them were swimming, but this little guy was resting in the vegetation on the bank. One night we had paused momentarily while my guide spoke on a walkie-talkie to someone about elephants. (A surprisingly large percentage of conversations were about elephants.) While he was talking, I noticed a black-and-white pattern near his feet. 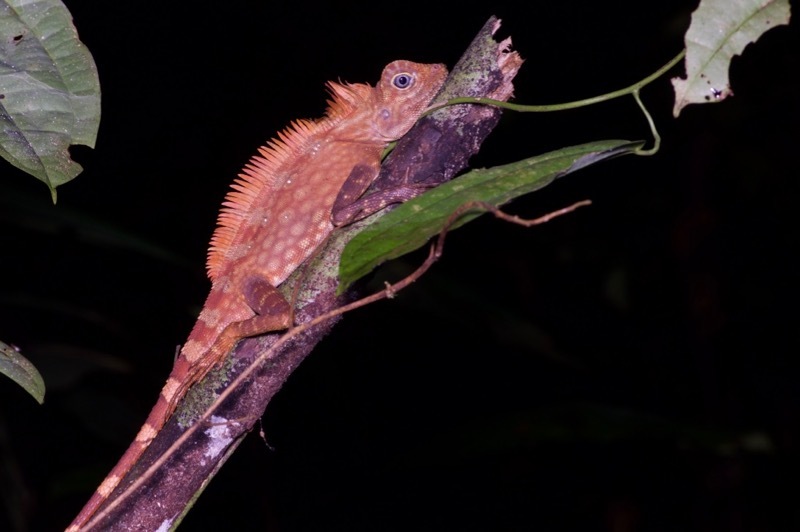 I didn't see tons of different herps in Danum Valley, but I did see an assortment of really good mammals. 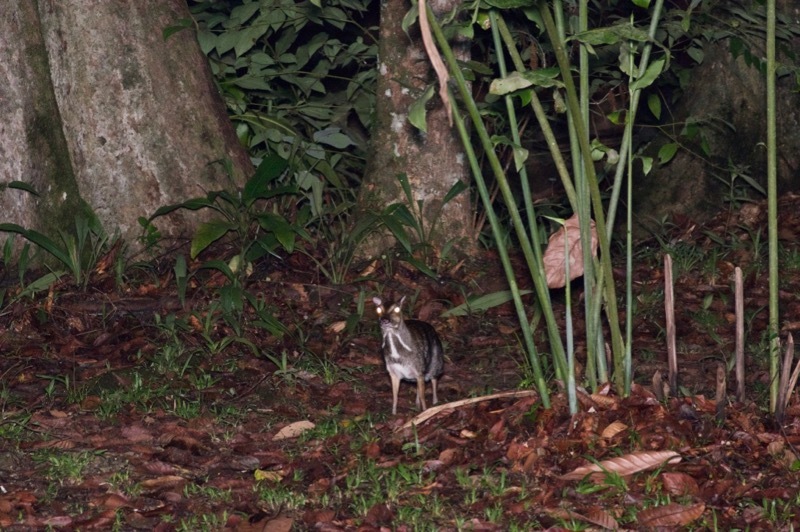 For example, here's a small deer that can shoot laser beams from its eyes, I think. I might have gotten that part wrong. 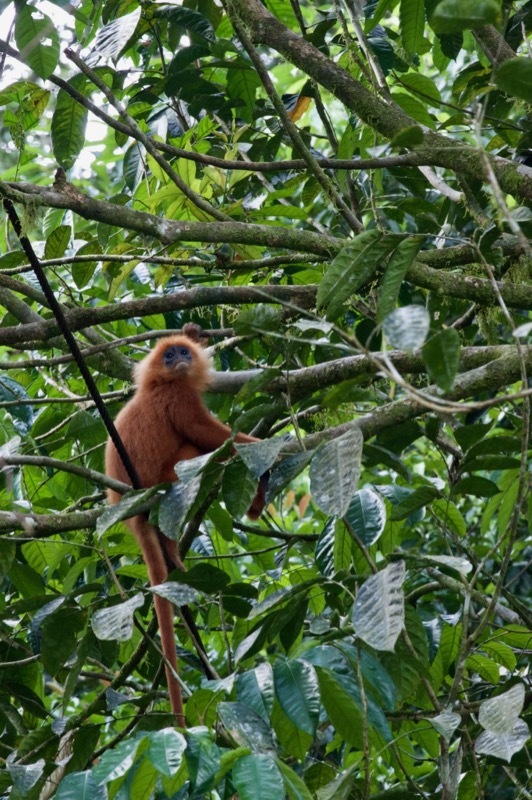 One of the highlights of Danum Valley is its healthy population of wild orangutans living freely in primary rainforest, a combination that is difficult to find most anywhere else. I did end up seeing several in the few days I was there. Most of them were resting high up in trees such that I could only get a glimpse with binoculars. 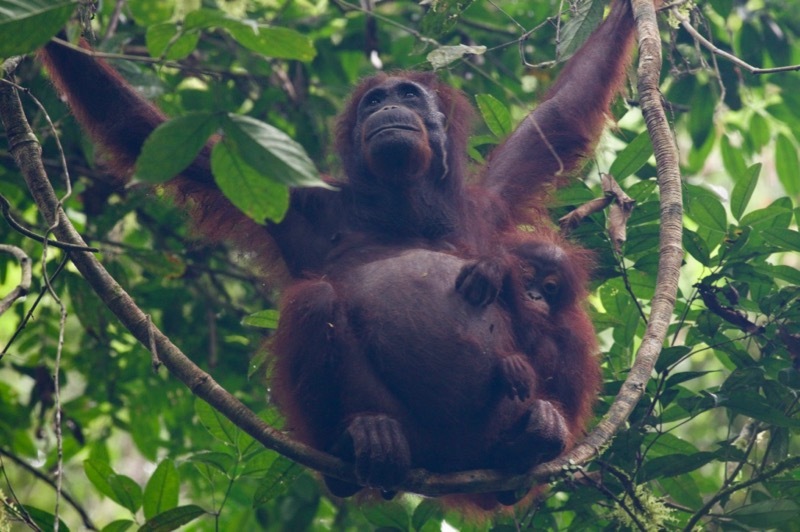 But one morning my guide and I came across a mother and baby orangutan that were moving through the forest, grabbing tasty leaves as they went. The thick, dark forest and continual motion made photo opportunities practically nonexistent, but I did manage one halfway decent shot of this pair. As I mentioned earlier, there was much talk of elephants. 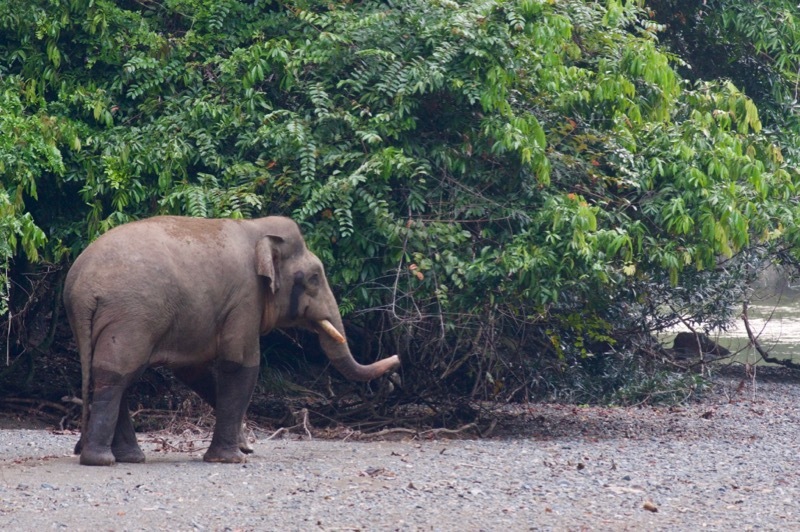 Borneo has its own subspecies of Asian Elephant, the Borneo Pygmy Elephant. (These elephants are unsurprisingly smaller than your standard elephants, but they are still huge. Elephantine, you might say.) It seems that a troop of elephants moves through the forest in the vicinity of Borneo Rainforest Lodge only once or twice a year. I happened to arrive on the same day as such a troop, and so the lodge staff was abuzz with elephant talk. Naturally, all the guests wanted very much to see the elephants, and the guides wanted to make the guests happy. But elephants are not always the gentle creatures we would like them to be. My guide told me the story of an elephant that reacted to a camera flash by chasing down the offending tourist and killing her with a combination of tusks and feet. I'm not completely sure that this story was told exactly as it happened, and no exact place or date was provided, but there is no doubt that elephants can be extremely dangerous. 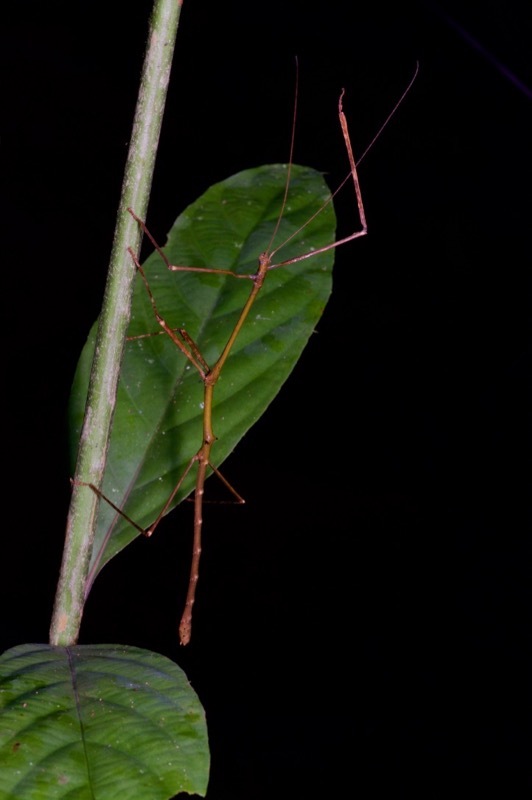 And they can be hidden in the rainforest a very short distance away without you realizing it. Much of the time I was with my guide we were actively looking for elephants, and part of the time we were actively retreating from elephants. Sometimes I wasn't sure which one we were doing. One night I heard my guide talking on the walkie-talkie, and I knew he was talking about elephants, and then he told me to come quickly and we ran through the forest for a hundred meters or so. I had no idea whether we were tryihg to see an elephant, or running away from one. 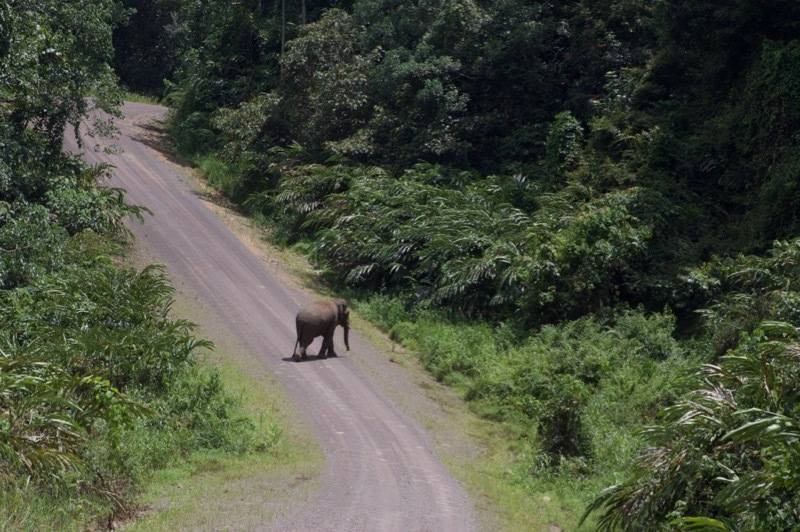 When we were swooped into a waiting truck I realized it was the latter; a mamma and baby elephant had been sighted close to where we had been hiking, and you do not want to be near a mamma and baby elephant in the forest. My next somewhat close near-encounter occurred the following morning. This time my guide was trying to find a solitary male elephant that had been sighted eariler by some lodge staff. We saw some elephant evidence including giant footprints and freshly-smashed trees, and then heard some currently-being-smashed trees. From our vantage point, we could see the trees moving and we knew there was an elephant in there, but it remained concealed by the forest. That afternoon we tried again. By now there had been some report that an elephant had been seen near the river, so we hiked a trail paralleling the river's edge. After an hour or so, my guide excitedly pointed to the edge of the forest on the other side of the river, where if I looked in exactly the right spot through the trees I could just make out an elephant's ears, face, and trunk. We watched this for only a minute or two before it pulled back into the forest. We stopped to wait and see if the elephant would return, and soon a few other people happened along and joined us in this wait. After about half an hour, the elephant obliged us by lumbering out of the forest, crossing the river in our direction, and putting on a brief one-elephant parade before crossing the river again and wandering out of sight. We saw the elephant! And it didn't kill or maim anyone! Everyone was happy that day. I later saw three more elephants. First, on my last morning hike (the one where I saw my second Ornate Earless Agama), we saw a baby elephant cross the trail ahead of us. A moment later, a mother elephant followed it, and the instant my guide realized this he grabbed my arm and we both started running in the opposite direction. Finally, that afternoon as I was riding back to civilization, another elephant strolled across the road in front of us. So the bottom line with Borneo Rainforest Lodge was: Not great for herps, but full of orangutans and elephants, and that ain't bad. Also, amazingly beautiful and comfortable rooms, and delicious and copious food. 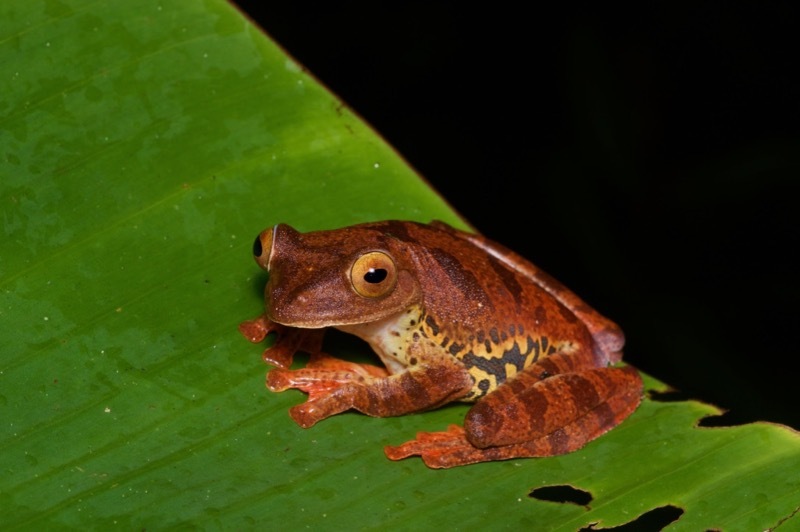 The bottom line with Borneo in general was: Definitely great for herps. 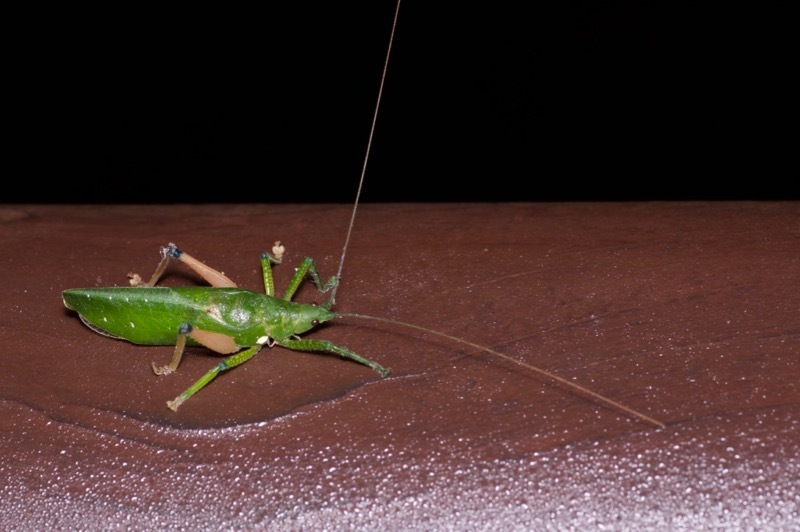 Also, lots of weird bugs. And some orangutans and elephants! 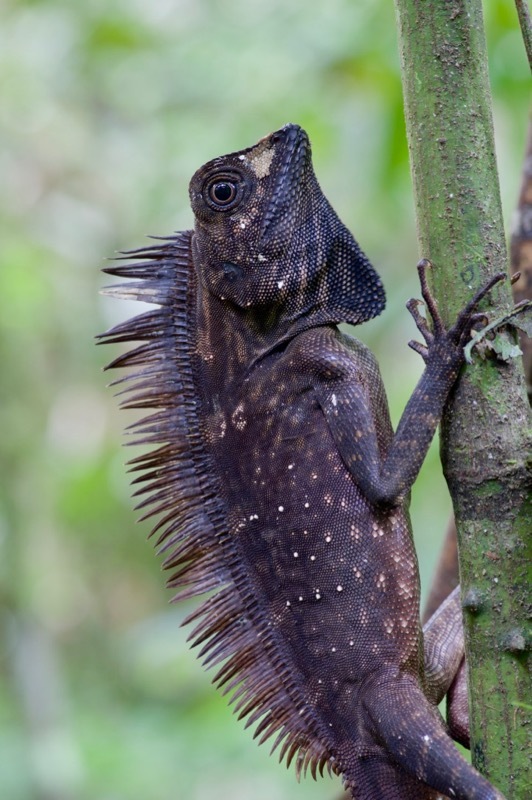 A herp species list for this trip, with lots more photos and blather, can be found on my website. Great series of posts! I loved all 5 of them. Thanks!! Nice one, John. I had forgotten that you proceeded to Danum after Kota Kinabalu! Although the herping hours were limited, you still managed to find a few lifer species (to me). 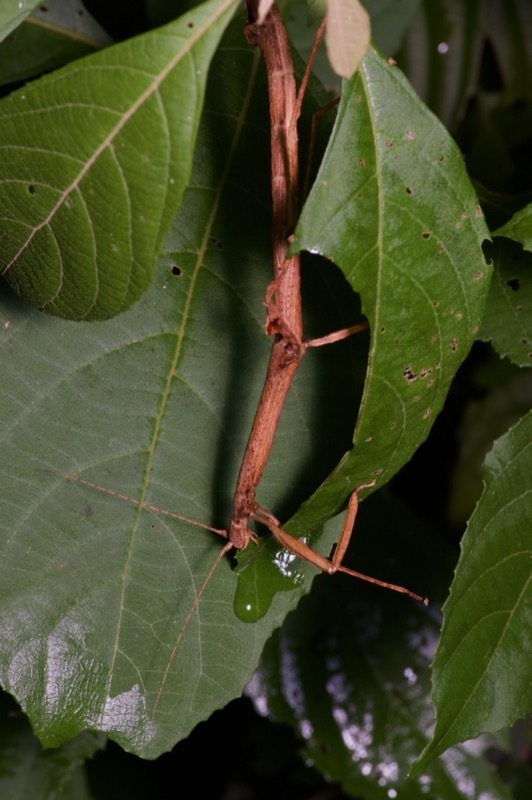 I still haven't found any Aphaniotis ornata nor Ptychozoon horsfieldii! I really enjoyed reading this series. Your multi-part adventures are exciting to look through. Thank you for sharing. Thanks Fieldherper and Derek! 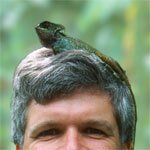 Kurt and I are on the verge of a trip to Ghana, so hopefully some good adventuring will come out of that. Thanks Rags. Do hold your breath about Ghana though. I am notoriously slow to catch up on these things. Thanks! Wonderful accounts and pictures. And a joy of recognition as I have visited several of those parcs myself. Now, after having seen your accounts, I'm considering going there again. It's been a long time and the "feeling" was suddenly back. 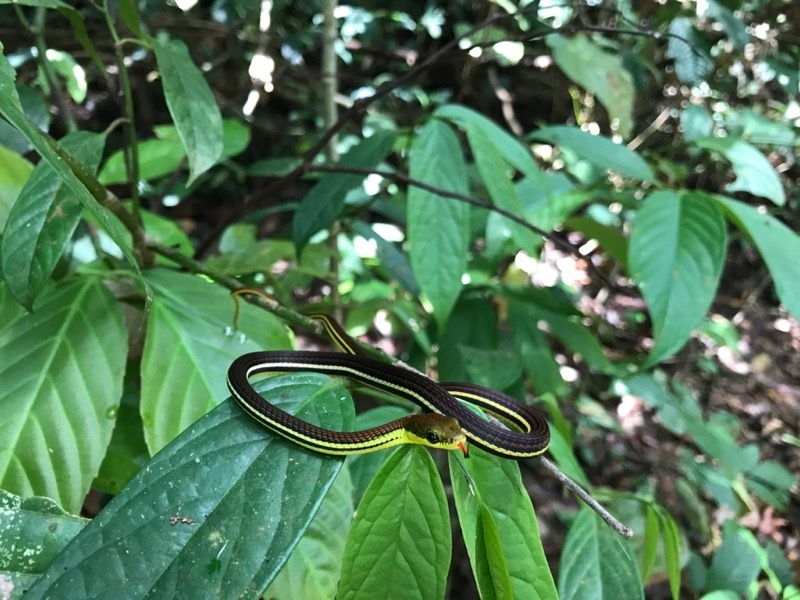 Thanks dendrelaphis! I know what you mean. 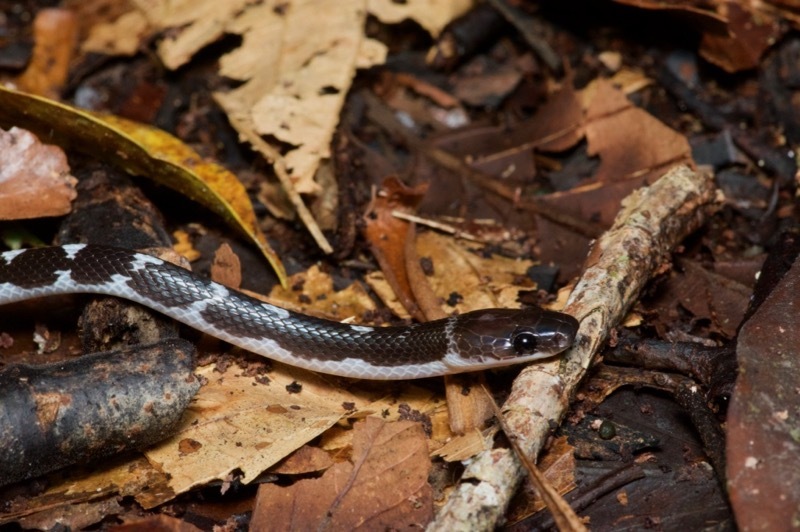 It's dangerous (to your wallet) to read herping stories! Wonderful stuff! 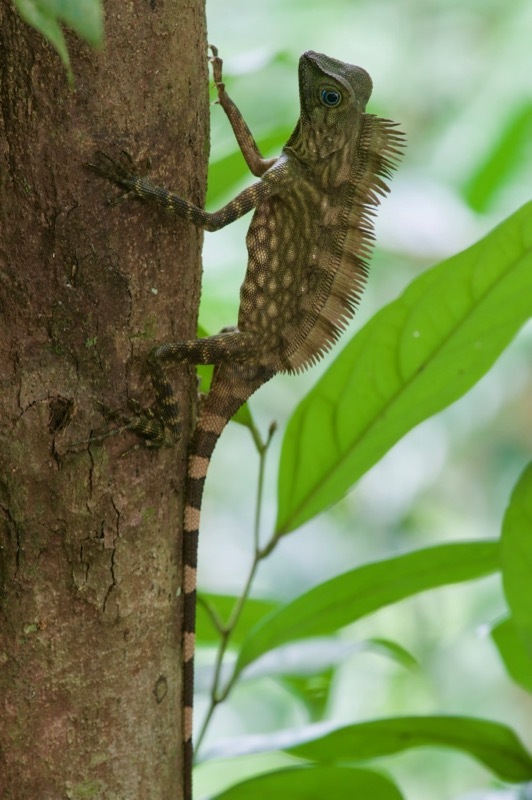 That Aphaniotis ornata is amazing ... reminds me of the leaf-nose lizards in Sri Lanka. 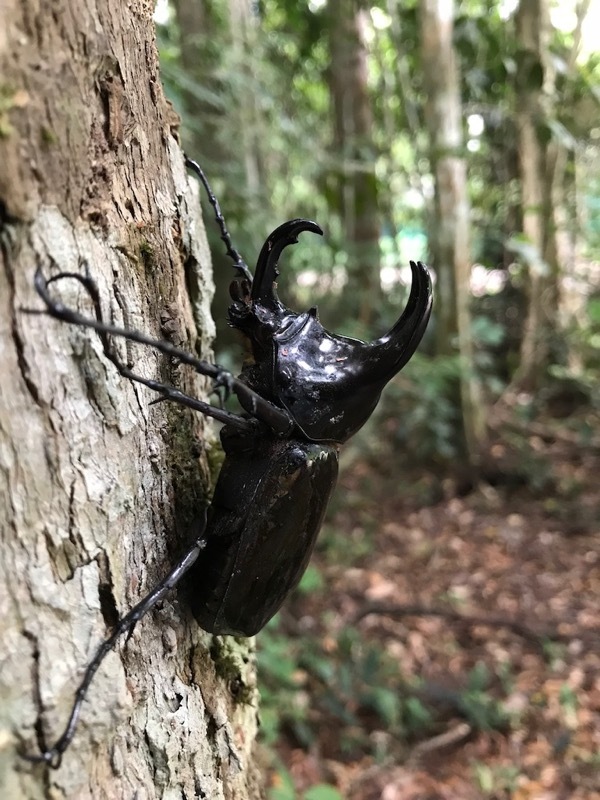 Didn't know these existed in Borneo! Great stuff, but did I miss the Nepenthes? Mom always said my whispering voice is too loud.